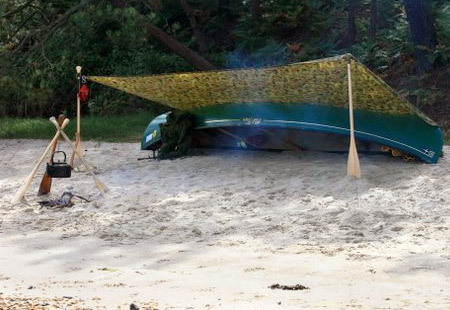 Set on a beautiful stretch of beach, it shows their Ray Mears Super Tarp pitched over their upturned canoe, providing a bit of much-needed shelter from the sun. Nice touch with the cooking tripod too! This entry was posted in Bushcraft Clothing & Equipment, Customer Posts on July 29, 2010 by Woodlore Team. Extremely nice set-up… well done Mark and Lucy!